Ansonia Clock Co., Royal Bonn, "LaOrb", ca 1904. 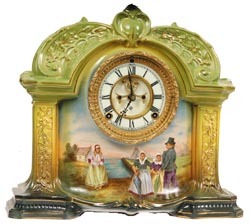 This clock is rare because of the Holland scene on the front. We have seen a few examples of this model, but none with the Dutch decoration over the front. Mostly greentints were used with a little yellow and the gold over all the case. Thiscase is larger than most at 13" high, 14.5" wide. See Ly-Ansonia, page 610, for several examples.